A volume kit is a very simple mod that will prevent the loss of highs as you roll down your guitars volume. Many pros will recommend slightly different methods on how to approach this. Click here to learn everything you ever wanted to know about this mod. 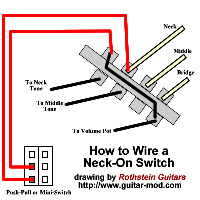 • HOW DO I WIRE A NECK-ON SWITCH IN A STRAT? This simple mod will turn a 5 sound strat into a 7 sound strat! 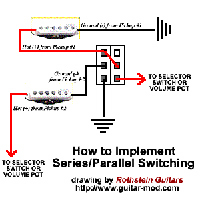 • HOW DO I IMPLEMENT SERIES PARALLEL SWITCHING? 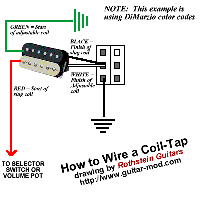 • HOW DO I WIRE A COIL-TAP FOR A HUMBUCKER? This classic mod is also known as a coil-split which will short one of the coils of your humbucker so you are left wtih one active coil. 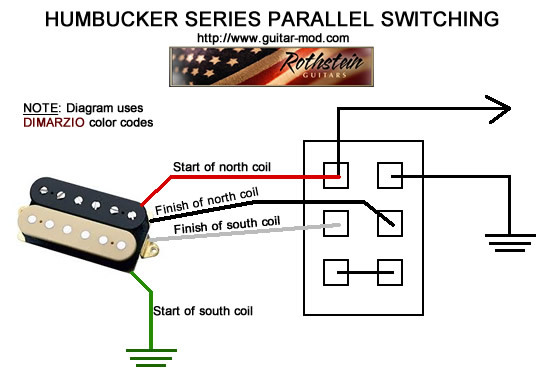 • HOW DO I IMPLEMENT SERIES/PARALLEL SWITCHING IN A HUMBUCKER? In full humbucking mode the tone will be full and strong. In parallel mode the tone will be clean, scooped and with less output. This is a common trick when using active electronics so you don't drain your battery while your guitar cable is unplugged. • Should I use 250K or 500K pots? 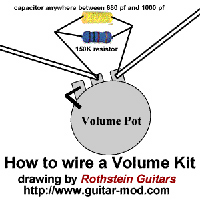 250K and 500K pots are the most common pots used in passive guitar circuits. Using higher value pots will give the guitar a brighter sound and lower value pots will provide a warmer sound. Higher value pots put less load on the pickups which prevents treble frequencies from bleeding to ground through the pot. The convention is to use 500K pots for humbuckers as well as hotter single coils, since hotter pickups can tend to sound darker and can use more highs. 250K pots are commonly used on traditional single coils that can tend to sound bright so added warmth of 250K works well. A personal favorite of mine is to use 300K pots for single coils which provides a very subtle increase in brighteness. • What is the difference between Audio and Linear taper pots? Linear taper pots provide 50% resistance at 50% rotation (eg. On 5). Audio taper pots generally provide 10% resistance at 50% rotation, although there are variations where some manufacturers produce pots with 20% resistance at 50% rotation. Either way, audio taper tends to provide a more gradual audio reduction perceived to be a smoother taper. • What is a No Load tone control? 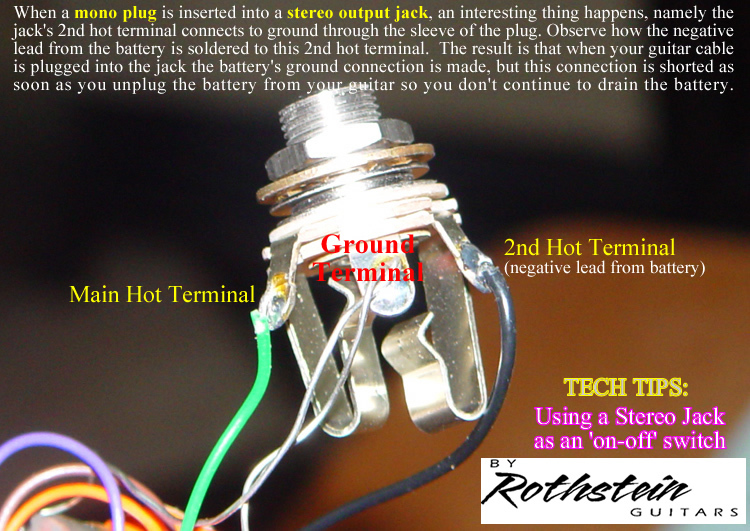 A no load tone control works just like a standard tone control from settings 1-9 but at 10 the pot and capacitor are both removed from the circuit, thus eliminating the path to ground that exists with standard pots even in the full treble position. The end result is that the only load on the pickup is the volume pot. From a tonal standpoint this equates to increased output and brightness when the pot is on 10. The reason for this is that the reduced load allows more output from he pickup to come through and reduces the amount of high frequencies that bleed off to ground. • What is a blender pot? A blender pot allows you to blend (mix) the neck pickup or the bridge pickup into the signal which will provide you with 2 extra sound, namely: bridge/neck (very Tele like) as well as all 3 pickups on simultaneously. If the 5-way is in the neck position, it blends in the bridge pickup. If the 5-way is in the bridge position it blends in the neck pickup. You can dial in as much or as little as you want. For example, one of Lindy Fralin’s favorite ways to use blender wiring is add just a little bit of the neck pickup to warm up the bridge pickup. Blender pots ideally should be “no-load” pots (see above) so when the pot is on 10 the pot is completely removed from the circuit, and therefore not loading the circuit in any way (think “true bypass”). • How does the tone capacitor value affect tone? The most common value capacitors for guitar circuits are .022 uf and .047 uf (where uf is the symbol for microfarads, sometimes referred as MFD). The tone pot and capacitor are wired together to form what is called a variable low pass filter. This means as you dial in the tone pot only the low frequencies pass to the output jack and the high frequencies are grounded out. The selected capacitor value will determine the "cutoff frequency" of the filter. Larger capacitors (eg. .047 uf) will have lower cutoff frequency and sound darker when dialed in because a wider range of frequencies is being reduced. Smaller capacitors (eg. .022 uf) will have a higher cutoff frequency and sound brighter when dialed in because only the high frequencies are cut. The convention is for humbucker equipped guitars to use .022 uf capacitors and single coil equipped guitars typically use ..047 uf capacitors. However, feel free to experiment. Some like to use .033 uf capacitors since they are in between .022 and .047. • What is the famous Clapton “woman tone” about? Eric Clapton often used smaller than normal caps on his tone controls and then rolled the tone all the way off to create what he referred to as "woman tone". This would give him a rather subtle, warm, yet beefy sound that had a great growl to it and provided a rather creamy distortion when overdriven. A good value cap to use for this effect would be a .015 uf capacitor. 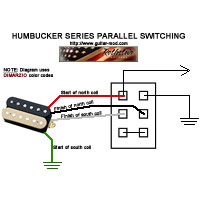 Here are a few graphics demonstrating the combinations available with 4 conductor humbuckers. For these examples, I chose to use Seymour Duncan's color codes (black = start of slug coil, white = end of slug coil, green = start of adjustable coil, and red = end of adjustable coil. Youu can substitue the color codes for any manufacturer.